Last year Fleury played great in the two game 7s the Penguins won. The first was in the second round against Washington. Fleury wasn’t the deciding factor in this game since the Penguins ran away with it 6-2, but his play was still important. Fleury only made 19 saves, allowing only two goals, which isn’t Halakian, but he made an enormous breakaway save on Alexander Ovechkin early in the game. If that goes in the entire game could have shifted. Maybe it lifts Washington and they win 6-2. The second game 7 was in the Stanley Cup final. Fleury made 23 saves, allowing just one goal, and made a spectacular save in the dying seconds to preserve Pittsburgh’s third Stanley Cup. Throughout the entire 2009 playoffs Fleury didn’t play amazingly (2.61 GAA and .908%), but he made big saves when the Penguins needed him to. This year he had a poor playoffs, posting a 2.78 GAA and an awful .891%. Instead of making big saves when the Penguins needed him to, he was giving up soft goals at the most inopportune moments. When these happened in Montreal it just drained Pittsburgh of all their momentum and gave the Canadiens an unshakable confidence thanks to the crowd’s craziness and knowing they were playing with a lead in front of Halak. All would have been forgiven if Fleury managed to pull out a 2009-like game 7 performance. 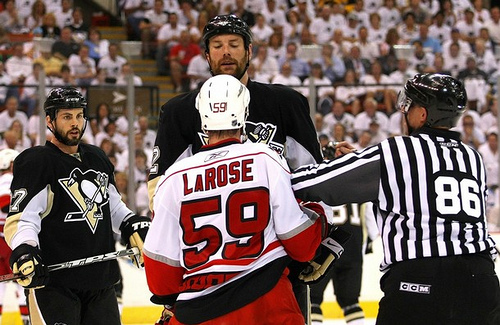 Instead, he was yanked early after letting the Penguins fall behind 4-0. Giving up a goal 30 seconds in almost sealed their fate. Even worse, in Pittsburgh’s two potential series clinching games Fleury posted an atrocious 5.68 GAA and .789%. Pittsburgh needed to only look at the Montreal bench to see the difference in their roster from this post-season to last. Gill played an integral role in the Pens’ playoff run the previous season and he provided the Canadiens with a similar steady and physical game. 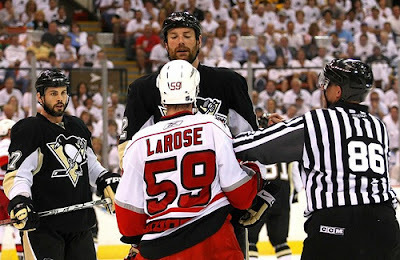 Gill’s defence partner in Pittsburgh, Rob Scuderi, was lost to free agency as well over the off-season and the defection of two of Pittsburgh’s most physical defenceman really hurt them this year. The brunt of the physical load was placed on the shoulders of Brooks Orpik, who managed 50 hits and 30 blocked shots over the post-season. The next leading hitter was Kris Letang with 19. Gonchar, Goligoski, and Leopold didn’t even manage 10 hits each (although Leopold played only 8 games). In a cap world there will always be tough decisions to make during the off-season and the Penguins couldn’t realistically sign both Gill and Scuderi. Unfortunately, they didn’t replace them with any defenceman who play a similar game and instead banked heavy on puck-movers. Gonchar, Goligoski, and Letang weren’t able to fill the void left by the two deportees and the Penguins paid for it in the playoffs. Philosophically, I’d say you should go with half puck-moving and half steady, physical defencemen. Any imbalance should favour the steady, physical style of player, since, you know, they can actually play defence. Last season the Penguins made two savvy acquisitions that put them over the top. They poached Bill Guerin from the Islanders for a low-level draft pick and acquired Chris Kunitz from the Ducks for Ryan Whitney (who was expendable because of Goligoski and Letang). These two players provided the Penguins with the sandpaper they needed and also came with a proven track record of winning the Stanley Cup. This year the Penguins’ management tried to replicate this by acquiring Alexei Ponikarovski from the Maple Leafs in exchange for Luca Caputi. The fit looked good on paper. I thought Poni would be a great addition to Malkin’s wing, in the same way that Kunitz and Guerin worked well with Crosby. He's big, he's strong, and he has a pretty nice set of hands. I also overlooked what drove me nuts as a Leafs fan. The Penguins probably thought the same thing - they were going to get a bigger and stronger version of Chris Kunitz. Unfortunately, they didn’t realize that while Ponikarovski is 6’4 220, he doesn’t play like he’s that big at all – maybe once every three or four games. In the playoffs Ponikarovski only scored one goal and managed to produce only five points. He was even a healthy scratch for a stretch in the second round. He was a dud really. The Penguins other deadline addition was Jordan Leopold, who cost them a second round pick. Leopold registered zero points and was a -2 in eight playoff games. This may have been the effect of a vicious Andy Sutton body check that must have left Leopold’s head groggy. Regardless of crushed melons, Jordan Leopold has never been a steady, physical defenceman, which is what the Penguins needed. He has always been an offense first player. The Penguins didn’t need to add another soft, offensive player to their blueline. They should have tried to land the aforementioned Andy Sutton, who would have definitely added a physical dimension to the Penguins defence that was desperately needed. While the Penguins were probably a good enough team to go further in the playoffs based on the relatively weak competition in the East (on paper…which is why they play the games I guess), it isn’t entirely shocking that they didn’t. This was a team with one too many holes and it caught up to them in the playoffs. With both Crosby and Malkin shut-down it became apparent that the Penguins didn’t have enough in the way of support to advance to the third round. I’m still shocked that the Habs beat both the Penguins and the Capitals, but I suppose after looking at each situation a little closer it isn’t as ridiculous as it would have sounded in late March.